There recently have been articles in the press which claim that because a certain multivitamin has not shown proven reductions in cancer, heart disease, and/or other illnesses, it is therefore worthless to take a multivitamin. Unfortunately, the authors (including doctors and other so-called “experts” on nutrition who may have no training on the subject) who write these articles are usually quite ignorant of the facts regarding nutrition and its relation to health. That is, they simply do not understand the known facts about nutrition, lifestyle factors, toxins, stress, food quality, etc. that impact our health. Below we clarify why it is important for your health to take nutritional supplements and recommend what basic nutritional formulas should be taken. We want to emphasize that nutritional supplements are not suggested as a replacement for a healthy diet. It is strongly suggested that you eat a natural whole-foods diet that is primarily organic, eliminates genetically modified and synthetic foods, and includes a significant amount of raw vegetables and fruits. In 25 years of working in the health field, we have observed that few people understand how to properly select supplements as part of an optimized nutritional supplements program. Too often they take a piecemeal approach to nutritional supplements. A common scenario is that they hear from a friend or acquaintance that a particular nutrient works for a certain health issue or that another nutrient is useful for dealing with a different issue, etc. They cobble together a set of nutrients that could not possibly meet their true needs. A piecemeal approach includes, for example, persons who take an inadequate (i.e., low potency) multivitamin (often with toxic food colorings and synthetic forms of Vitamin E), yet neglect to take essential fats that are controllers of many important functions in the body! Generally speaking, this approach fails because it misses important nutrients needed by the body. A piecemeal approach often overly focuses on immediate issues without helping to establish intake of nutrients that create and maintain optimal health. We have observed that it is important for individuals to begin their nutritional supplements program with Foundational Supplement Formulas. These provides significant amounts of the basic nutrients satisfying nutritional requirements identified by research and clinical experience over the last 75 years. We have documented this in our Foundational Supplements booklet and on the HPDI website (www.IntegratedHealth.com). High-RNA superfoods, which supply critically needed nucleic acids (i.e., dietary RNA and DNA). There is less awareness among consumers about the benefits of dietary nucleic acids compared to other essential nutrients, but they are highly important for healing and health. In fact, the need for RNA was well recognized over 50 years ago when it was common knowledge that eating liver, a high RNA food, once a week was important for good health! While there are a wide-range of supplements, including many that support specific problems or conditions, we always recommend starting with foundational supplements because taking these four types of formulas helps build, support, and maintain the health of the body. The reason that foundational supplements are needed is not a mystery. There is plenty of evidence supporting the body’s requirements for them. This is because during the past 70 years, nutritional scientists deeply explored fundamental questions about essential nutrients the body needs to properly function, as well as substances the body needs from outside sources because it cannot synthesize them. There are in fact, tens of thousands of studies published in peer reviewed literature supporting the body’s need for these nutrients. The current scientifically accepted list of essential nutrients includes thirteen vitamins, more than twenty minerals, two essential fatty acids, nine essential amino acids, a source of calories (includes protein, carbohydrates, and fats), water, oxygen, and sunlight. We add to the list dietary nucleic acids (especially RNA) based on the research of Dr. Benjamin S. Frank. Daily values (DVs) are established for most of these substances, but represent only minimum amounts needed to avoid disease. Consequently, these values do not address amounts needed for optimal health. Regarding optimal daily values, there is a vast body of research on nutrients, which in addition to our experience, provides insights into what might be optimal amounts of nutrients for health. It is no surprise that optimal values for essential nutrients are nearly always significantly higher than established daily values. This is because minimal amounts of nutrients required for mere survival cannot sustain vibrant health. Daily values are, in fact, probably better described as “deficiency values” because these amounts hover dangerously close to actual deficiency levels (depending on the individual) and most likely describe a state of “subclinical deficiency” (if not actual deficiency), whereby actual deficiency symptoms are temporarily masked. Foundational nutritional supplements provide important nutrients in amounts not easily available in the diet. This relates to the fact that our needs for nutrients have never been greater. Our needs for nutrients are greater due to many factors, including diets high in nutrient-depleted and processed foods (e.g., refined carbohydrates), and low in fresh vegetables and fruits. This actually describes the so-called “Standard American Diet,” or “SAD,” which has been implicated for its negative health effects. Biochemical individuality resulting in greater needs for certain nutrients depending on the unique biochemistry (genetic profile) of an individual. Biochemical individuality means that someone may require many times the recommended US Daily Value for specific nutrients. Consequently, one person may need hundreds of times the amount of a nutrient compared to another person’s requirement. A review of nutritional studies indicates that deficiencies of most nutrients among individuals range from 25%–95% depending on the nutrient. Such major deficiencies are less surprising given studies indicating that nutrient losses from the processing of foods range from 20%–95%, and average 70%–80%. For example, losses due to food processing are about 85% for magnesium and 95% for essential fats (omega-3 and omega-6). In addition, mineral levels measured in plants grown in poor soils (a result of inadequate agricultural practices) are as low as 5% of the mineral levels measured in plants grown in nutrient-rich soils. Complicating this picture is the fact that nutritional requirements change during the year due to environmental circumstances. Changing seasons, environments, air/water supply, etc. mean that an individual’s need for nutrients typically changes (e.g., more Vitamin D needed in the winter, more nutrients needed to cope with pollution associated with urban environments or stress, etc.). Nutrient density of foods also varies by location and season. The availability of nutrients in foods can vary substantially due to season, geographic factors, and growing methods. All these factors add up to indicate the difficulty of ensuring optimal nutrient status without foundational supplements. Because the need for nutrients is greater than ever for most people, the need for nutritional supplementation is also greater than ever. Nutritional supplements provide an effective (and cost-effective) means to ensure the high levels of nutrients required to build, sustain, and maintain optimal health. An important consideration (often overlooked because nutritional research typically examines only one or two nutrients at a time) is that hundreds of nutrients act and interact in our bodies simultaneously. Considering that the recommended (i.e., minimum) amount of a single nutrient rarely represents optimal intake, adverse effects can significantly increase when a broad range of nutrients is present only in suboptimal amounts (i.e., when there exists a deficiency of optimal amounts of nutrients). The function of the human body might be likened to an automobile factory. If a factory is designed to optimally produce 100 vehicles per day, then the factory must be supplied with at least minimum amounts of all essential raw materials to make this happen. In this case, incorrect amounts of raw materials, for example, 40 tires, 91 transmissions, 67 drive trains, 13 exhaust pipes, etc. would never allow optimal automobile production. It becomes evident that important relationships among parts must be honored for the entire system to function properly. Like an automobile factory, the human body needs proper amounts of critical “raw materials” (i.e., basic nutrients) to perform optimally. However, the need to obtain appropriate “materials” in correct amounts is arguably more relevant for the extremely complex human body. In this regard, scientific studies on nutrients perform a disservice when they fail to consider complex interactions among nutrients in the body required to support optimal function. Minimum levels of nutrients can only lead to minimum health. Following the analogy of an auto factory, the body cannot create optimal health from insufficient raw materials (nutrients). 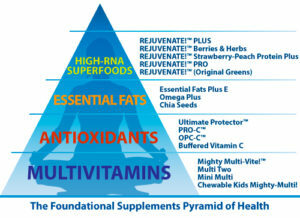 In fact, we have an accurate picture of what levels of nutrients support optimal body function. We are aided in this knowledge by solid scientific studies. It is established that basic nutrients provided by foundational supplements confer immense benefits for health. Indeed, basic nutrients have proven remarkably effective for improving health, especially relative to their cost. Foundational nutritional supplements are far less costly than pharmaceutical drugs or the medical procedures used to treat health conditions related to nutrient deficiencies, which often can be prevented by dietary supplements. In addition, there is the fact that natural nutrient substances exhibit extremely low toxicity. Most vitamins, for example, demonstrate low toxicity (even at levels significantly higher than official daily values). The “2008 Annual Report of the American Association of Poison Control Centers’ National Poison Data System (NPDS): 26th Annual Report” published in Clinical Toxicology (2009) indicates not a single fatality caused by nutritional supplements in the US that year. This underscores the safety of vitamins, minerals, herbs, and amino acids. While this figure may seem remarkable considering that more than half the US population takes daily nutritional supplements, it confirms the safety of natural nutrient substances. Indeed, essential nutrients are safe and effective precisely because they naturally work together within the body to create health. On the other hand, prescription drugs, even when taken properly, are a major cause of death in the US, killing over 100,000 people every year! This is a major public health threat. FDA approved, firmly regulated drugs are causing gigantic harm to the public. Clearly, it is important for your health to take a high potency multivitamin on a daily basis. However, just taking a multivitamin allows you to be deficient in other nutrients that are required for complete basic nutrition and can lead to major deficiencies and serious health issues. We urge our readers to become familiar with the foundational supplements we have discussed and be sure to get everything needed for optimal health! May I simply just say what a relief to uncover somebody who truly understands what they’re talking about on the internet. is, in addition, an extremely effective weight loss supplement. lots of vape pen testimonials for research objectives. to those who haven’t ever also attempted a vaporizer before. Pro Collection 7 vaporizer shipshape. It’s not my first time to pay a visit this site, i am visiting this site dailly and obtain good information from here every day. so afterward you will definitely get pleasant knowledge. I pay a visit everyday a few web sites and sites to read posts, but this webpage gives quality based content. Hi, I do believe this is an excellent site. I stumbledupon it 😉 I may revisit yet again since i have bookmarked it. Yes, you can follow us at @livinghealthapp.